Stupid German Sig products drying up!! I already ordered and received 6 extra mags (bringing my total to 8) for my newly acquired SIG 230 and I am glad I did it so promptly after receiving it (I actually ordered the mags before it arrived). Today I went to order some more and this is what I found below. Not "out of stock, no backorder" ; it is simply "Discontinued"
Re: Stupid German Sig products drying up!! Sig is moving all manufacture of civilian sale handguns and rifles to the U.S. They won't be supporting German made products that are not part of current inventory. Sig stopped making the P232 recently. If I were in that position, I would hang on to them, hold out for $$$$ on the accessories, or dump them all on Gunbroker soon if I were worried. I have a 229 and X5 both made in Germany...I'll be holding onto both. I bought a P250F as my first Sig. I didn't like the trigger. Sold it. No more SIG's for me. The 250 series is not representative of SIG's quality. The magazines are already expensive enough. For all makes of SIGs besides the 1911s and 230/232 I use Mec-Gar mags anyways. My impression of mec-gar was they were not very good. Not sure really where I got that thought from. Mec-Gar makes the magazines for SIG as well as many other companies. Mecgar makes factory mags for many guns - they used to make the factory mags for Beretta years ago. 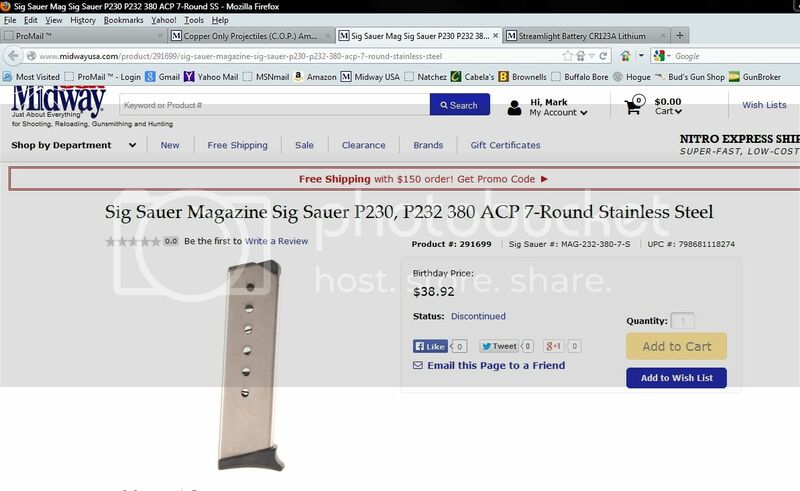 They make mags for Walther, and did make Sig mags for a while. Most of the Sig mags are now made in the USA by Checkmate, unfortunately. I would rather have the imported factory Sig mags of old. Same here. Those and Wilson Combat ETM mags for 1911s. I have some of those but for the price I prefer the ETMs. I have never had one fail yet.